Most people think yoga has to do with the amazing and strange looking body poses yoga practitioners are doing online or at a yoga studio. However, the true nature of yoga is not the physical aspect of it, but the freedom and transcendence of the mind and body achieved through true discipline and becoming absorbed in the True Reality itself. Yoga is not a religion, it’s really a science of life that deals with the body, mind, soul and the universe itself. You can be a Buddhist, Hindu, Catholic, Jewish, any religion and still do Yoga and get to the point where you can transcend body, mind, soul and ultimately the universe itself. You become whole or unified with everything instead of living in a state of separateness or singleness. We are all capable of that no matter where we are at as human beings. So, why is yoga important? When we practice yoga, it balances our physical bodies, our mind, and our spiritual or subtle being. Yoga helps in recharging our body with the divine energy that is always present and provides us with perfect equilibrium and balance, body-mind healing, it gives us increased flexibility, helps to get rid of toxins and blocks in our bodies, helps us be more aware of what is around us, as well as with our focus and attention and it helps us reduce tension in our bodies by going directly to our nervous system and balancing it. Yoga also teaches us a lot about conductivity with the various breathing and pranayama exercises. With pranayama exercises, we can control the breath to achieve beneficial results such as cleansing of our blood, purifying our respiratory system, giving more oxygen to our blood, cleaning a ton of nadis or channels in our body and overall Pranayama exercises allow us to achieve a peaceful and blissful state of being. It teaches us to maintain that equanimity throughout our day to day lives and not just on the mat. Yoga is perfect for all ages! I see teenagers doing inversion and backbend poses. They love the handstands and headstands and do them with such ease – it’s truly inspiring. Practicing yoga at this age is also important because it’s a crucial point in a women’s life where so many changes are happening and Pranayama and meditation, for instance, will aid in calming a restless, fearful and confused body and mind for a teenager. Also, there are also various Asanas that will help balance the cycles women go through such as the menstrual periods. Women in their 20s like are more flowing, moving yoga practices like Vinyasa or Hot Yoga and there are many Asanas that are supportive for the times when a woman is pregnant, helping these women go through this process more easefully. As women get older they appreciate a more rigorous yoga practice. Women in their late 40s and 50s begin to acquire an appreciation for both a restorative yoga practice as well as a rigorous yoga practice. Yoga begins to move with you and evolves as you get older, wiser and have more intuition. Yoga can really become your companion for life – that is the secret! With repetition, a regular practice and patience, yoga can transform us all in ways we never imagined. If you would like to read more about the history of yoga and the different types of yoga, please visit the What is the History Behind Yoga page. If you have any questions or comments, please be sure to leave them below. That’s great, I am glad and you are very welcome! I love how you described yoga as being a practice that can be “your companion for life” what a cool and eloquent way of phrasing it! I have practiced yoga off and on for years now, and I will say that I notice a huge difference in my anxiety and sleep quality when I am actively practicing versus when I am not. 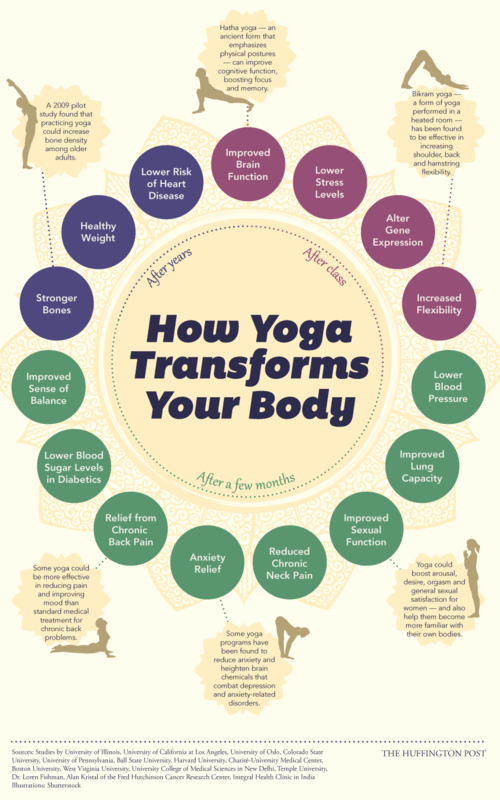 You have done an excellent job of breaking down yoga, and I especially love the graphic that you have featured here!! Thank you Lauren, it certainly has become my companion and I am glad you think it eloquent to say. It’s great to know that practicing yoga has helped you with anxiety and sleeping better. I used to get anxious a lot too and yoga has definitely relived me from that as well as other things including back issues. I am happy that you liked the image I used and feel free to visit the site again whenever you need some inspiration! I actually discovered yoga when I started to study Ayurveda in 2000. It has served me well for over 17 years. The first 10 years or so I went to a studio, then when that was no long an option for me, i just started to practice on my own at home. I’ve learned equally and differently from both. There are some things that cannot be taught and must be discovered from your own practice. Thanks for your post! Wonderful Jackie, I am happy to liked the post and it’s great to know that you studied Ayurveda – I have yet to discover it fully. The studio I go to offers Ayurveda workshops from time to time and so I am looking forward to catching the next one. It’s also great you have kept up with the practice at home. It’s not easy to find a studio that works for everyone and so it’s great you practice on your own. Do you use online yoga videos or do you have a routine you do everyday? Thanks for stopping by and feel free to visit again when you need some inspiration! Yoga certainly transformed me from inside out. I’ve been practicing for more than 5 years now and loving it. The poses not only teaches me flexibility, but it also patience and embracing imperfection. Not everyone will achieve that kind of height or bends. In Yoga, my teacher always says, it’s the intention that counts. Intention leads to action and action leads to results. That’s how the world functions and once you understand that fundamental, anything you desire is possible. It’s completely normal and I can feel myself trying do perfect my poses in class as well. But, yes, doing the poses with full intension and feeling is the key. It’s surprising how the body then just follows. So many great points you make. I don’t know why yoga gets the stereotype that it does with so many people… I love it and always have. I have anxiety so it helps me in that department for sure, and of course with many of the other things as you mentioned. Great stuff, thanks for sharing. Thank you Jen for your comment. It’s nice to hear others express their love for yoga – it’s very inspiring! I too get anxious a lot, so yoga has definitely helped me a lot with that as well as with back issues from working with computers for most of my life. I also find it extremely happy because I can take so much of what I learn from it to my everyday life and the way I relate to others. Thanks for visiting and feel free to come by again if you are moved to do so. A beautiful blog and a beautiful post. Although I’m not that regular with Yoga but I do try to do yoga for at least 15 minutes once a week. And I must say that those 15 minutes are probably the best 15 minutes of my entire week. When I first started with yoga, I used to think that it’s about those postures and it looked quite difficult and therefore, I kind of stayed away from it. But after learning about the limbs of yoga and then really getting into the action and practicing it, I realized how beautiful and soothing this thing is. I also loved the beautiful infographic that you included here. That added more beauty to already beautiful post of yours. Thank you very much, very sweet response! I too feel the same way when I am in class – that hr or hr and a half that I am on the mat is the best time for me. It’s when nothing else matters and I can connect with that essence that makes me so happy. I am glad you liked the infographic and thank you for stopping by. Feel free to visit again if you feel moved to do so. Next PostNext Why are Headstand Poses So Challenging?